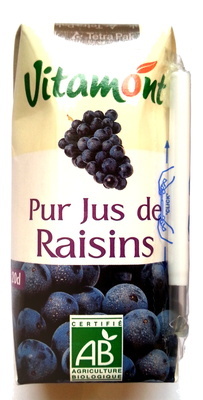 Jus de raisins issus de l'agriculture biologique. Product added on January 22, 2013 at 5:31:31 PM CET by stephane. Last edit of product page on February 28, 2019 at 3:12:10 PM CET by cyn. Product page also edited by date-limite-app, drunkenbison, kiliweb, openfoodfacts-contributors, tacite, teolemon.